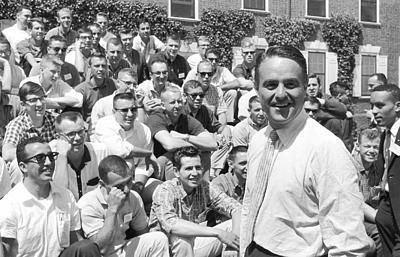 The legacy of the late Sargent Shriver has been well documented in recent days; 1st Director of the Peace Corps, founder of Head Start, VISTA, Job Corps, Upward Bound and along with his wife, Eunice Kennedy Shriver, the Special Olympics. But I’ll always remember his kindness toward a 20-year-old budding journalist in the snows of New Hampshire. Hard to believe it was 35 years ago, but in January of 1976, a photographer friend and I took off for New England to cover the New Hampshire Presidential Primary. I had managed to convince the Editor of my local hometown newspaper, the Reston Times, to pay me a whole 200 bucks for a feature piece and so we proceeded onto our low-budget American political adventure. This would end up being the election that featured Gerald Ford and Jimmy Carter but in January there was a spirited contest in each party with Ronald Reagan challenging Ford and a slew of Democratic hopefuls that included folks like Carter, Mo Udall, Henry “Scoop” Jackson, Birch Bayh, Fred Harris and Sargent Shriver who four years earlier had been tapped as George McGovern’s Vice-Presidential candidate. I got to meet just about all the candidates though I hung out mostly with the Fred Harris people. The former Oklahoma Senator was incredible on the stump and he was fun. He refused Secret Service protection so Harris and his Native-American wife, LaDonna, had a certain amount of freedom the other candidates didn’t. I remember the time the entire caravan, a couple of Winnebago’s and three or four Suburban’s, suddenly pulled off to the side of the road. Turned out we had happened on an ancient Indian burial site and Fred gave reporters and staff an impromptu tour and lecture. Twenty minutes later we were back on the road and headed toward Manchester where Fred had a speaking engagement before a local pancake breakfast gathering. It was there my photographer friend and I split off from the Harris people and I ran into elements of the Shriver campaign and asked if I could get a brief interview with the candidate. This was not an easy ask, mind you. We represented…not the Associated Press or CBS News or the New York Times…no…we were—the Reston Times. Anyway, the Shriver people were great and arranged for me to ride in the candidate’s car that night as he headed to a campaign rally. I found myself squished in the back seat with Sarge on my left as I peppered him with policy questions. The truth of the matter though, is that I was attempting a version of guerilla journalism. That is, my article was less about policy and more about the textures and sights and sounds of the political circus that is the New Hampshire primary. He noticed I wasn’t exactly taking copious notes and if I had been they would have been something to the effect of- “Got ride in candidate’s car. Sarge- a very cool guy to give me the time of day.” And he really was so very gracious and kind to an obviously cub reporter. We arrived at a local high school in Manchester. There were about six inches of snow on the ground and lo and behold the sedan door opens, I step out, then Sarge steps out and there’s a full marching band to greet us. As I ended up describing it- “dozens of musical, marching, kicking legs greeting us in what amounted to a driving snow storm.” To this day, it’s a memory of retail politics at its endearing best. Yeah, it was a little corny but it was also kind of sweet. The young lady had ambitions to be a singer someday. She chose journalism instead and would end up being the First Lady of the state of California- probably our collective first exposure that night to Maria Shriver. So those are my two Shriver moments. America has lost a good, kind man who made it his mission in life to fight poverty and create government programs, like the Peace Corps- that actually work and that give Americans a taste of the world- and the world a taste of Americans at their best. Rest in peace, sir. And thanks for the interview.